All the elements come invigoratingly together like clockwork in this provocative play. 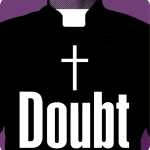 It’s a gripping story of suspicion cast on a priest’s behavior that is less about scandal than about fascinatingly nuanced questions of moral certainty. Blunt yet subtle, manipulative but full of empathy for all sides, the play is set in 1964 but could not be more timely.